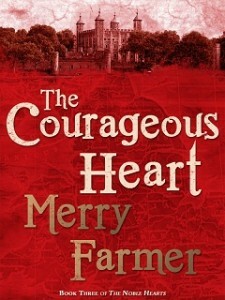 Today’s First Kiss Friday featured guest is Merry Farmer, author of historical romance The Courageous Heart. Welcome Merry! Here’s the first kiss between Ethan Windale and Joanna Dunkirke. Ethan was too cocky for his own good, but there she was, wishing he was telling the truth. She set the scissors aside and reached for the bowl of water. A cake of shaving soap rested at the bottom. She worked it into a lather and spread it on Ethan’s face. The line of his jaw, the feel of his skin, was as familiar to her as the shape of her own body. He had always been bold, had always thought he could conquer the world. He had been everything her young heart imagined a man should be. But that meant nothing now. She released his face, holding her breath and meeting his eyes. She would not let herself be taken in by his bravado and his smile again. She wiped her hands and took up the razor. Slowly, carefully, she scraped it along the plane of his cheek. Each stroke revealed smooth, pale skin, tinged pink with its first breath of air in who knew how long. The thin, raised white line crossed over the rapid pulse in his neck from his ear to his Adam’s apple. It was straight and bright and new. Joanna let out the breath she’d been holding, willing herself to believe his lie. The scar was too long to be a shaving accident. She summoned every ounce of courage she had to finish the job. When at last all traces of Ethan’s beard were removed she took a rag that had been left on the table, dipped it in the shaving water, and wiped his face clean. Her hands paused, cradling the sides of his smooth face. Their eyes met. He was there. The Ethan she knew, the Ethan she had known for so many years. Her brave knight. He was there once more, nothing hidden from her. His hands covered hers as she stood frozen, hardly breathing. Then he moved them up the lines of her arms to her shoulders, pulling her close. In silence, without a breath, he brought her mouth to his. She closed her eyes and parted her lips, tasting the warmth of his kiss. He was gentle, more tender than he had ever been. The heat of him so close to her, the pressure of his mouth, suffused her with remembered passion. She teased her tongue against his, inviting him to touch the part of her she had always longed to give to him. It was complete madness. His arms slipped around her, pulling her closer. The more she struggled, the more she gave him. His mouth slanted over hers, powerful, possessive, and so familiar it made her soul ache. She sighed against him. Her fingers stroked over the scar on his neck. She couldn’t bear to live without him for one more day. David’s overloud voice shocked Joanna like a bolt of lightning. She wrenched herself out of Ethan’s arms, pressing the back of her hand to her mouth. Her chest heaved with restless shame. Dear God, what had she been thinking? She snapped to the table, grabbing the bowl of dirty shaving water and splashing it across her dress in her haste to clean up. Excellent excerpt! Thanks for being my guest on First Kiss Friday! Thanks so much for having me, Laurel! You’re the best.